I am going to write this in terms you can understand, since cats and human have differing habits. I am a newlywed (six months married) and for some reason, every morning my husband "Joe" insists on barging in on me when I am "using my litterbox", if you know what I mean. He insists that he, too, needs to use the room where the "litterbox" is located to shave, shower, etc. and that since we are married we should not keep closed doors between us. I say that there is no quicker way to kill the romance of a relationship than seeing someone in such a private and undignified position. Our "litterbox room" does not have a lock on the door, so I am unable to shut Joe out while I am doing my business. I have tried waking up 5 minutes earlier, but then Joe follows suit. I have tried taking a shower first, but then Joe waits until I am out of the shower and using the "litterbox" before barging in once again. This behavior has been going on since we returned from our honeymoon and for me that honeymoon is quickly fading as this rude and annoying habit takes hold. Any ideas on how to solve this issue, Tazi-Kat? Other than this, my marriage is good. I must confess that, as a cat, I hate closed doors and will also barge in on people who are using the "flushable litterbox" just so the door will remain open and the room accessible. You are referring to your flushable litterbox in your letter, right? I can understand your desire for privacy while "doing your business", too, since I do not like when people watch me using my litterbox. For cats, it is a matter of personal defense - it is rather difficult to run from or attack a predator while you are in a squat position and unable to get out of it. For humans, it is a desire for privacy, which is something some people desire more than others. 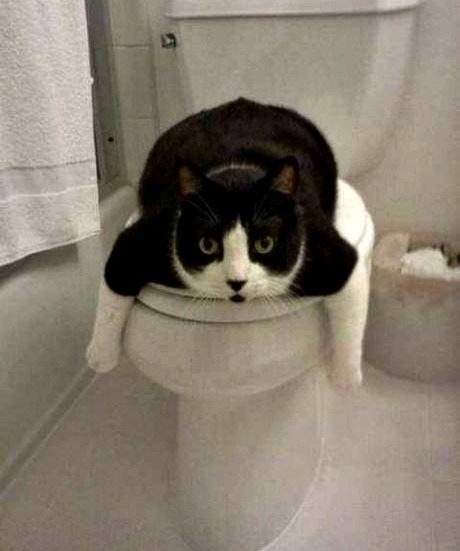 Your husband has a fetish for what goes on when you are using the flushable litterbox. All three of these possibilities are issues that should not be taken lightly, and not simply because they are invasive of your privacy. Over time, these issues could escalate. Although there is also the possibility that your husband does not suffer from any of the above issues, I would still recommend that the two of you speak with a counselor about his behavior. If your husband refuses to go with you, then go alone. Exploring this issue might help you learn to diffuse your reaction to your husband's inappropriate behavior - because it sounds like an adverse reaction is what your husband is seeking.